Everyone is going gaga for lace—even Lady Gaga. Lacey looks are everywhere and in fashion on Spring 2010 runways from Dolce & Gabbana, Douglas Hannant and more. Our own Alencon Lace Wedding Invitation Folder from the Vera Wang collection, is inspired by original French Alencon needlepoint lace—first made in France in 1665. 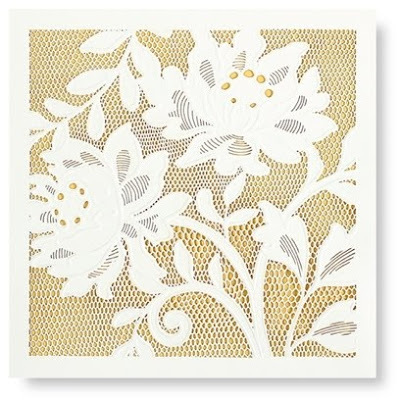 This exquisite laser cut invitation design is also inspired by Vera Wang bridal fashion and wedding lace.